Love this!! Simple, sweet truth, heavy with wisdom!! 🙂 Thank you! Yes, it’s the Son we seek. We can fully lean on HIM. Natasha, your blog is such a blessing and reflection of your love for the Lord. I so appreciate you posts pointing us to Him. Thanks for stopping in, Sue! My youngest put him in front of the kitchen window. He makes me smile quite often 🙂 Thanks for your visit, Wendy! Absolutely sweet, Heidi. 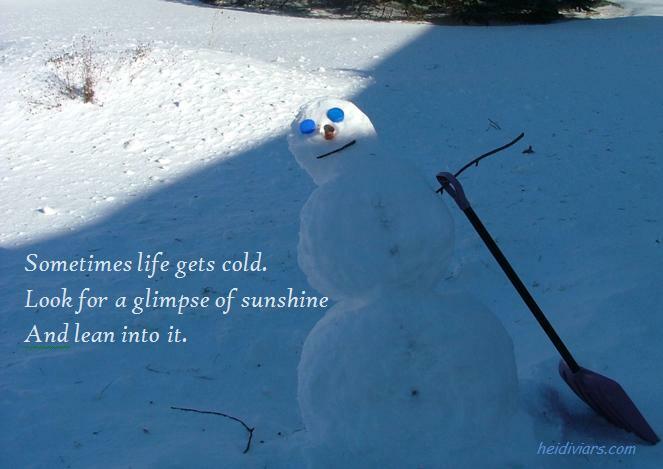 Love that snowman – the eternal optimist! Thank you, Hannah, for stopping in and commenting 🙂 Have a blessed Sunday! A brilliant piece of haiku! And the photo is a smile-maker visual. Thank you, Heidi, for ministering to our spirits with good truth and humor.